1. The national forces, which are formed and organised for the preservation of our independence, are protected against any kind of attack or interference. The national will is sovereign in regard to the guidance of the fate of the State and the people. The Army is the willing servant of the national will. 2. If, for some reason or other, inspectors and commanders should be removed from their command, they may transfer it to their suc cessors provided that these have the necessary qualifications to work with, them; they should, however, remain in the district where they have any influence and continue to carry on their national duties as before. If, on the other hand, men should be appointed who might have been responsible for incidents similar to those that took place at Smyrna, the command is not to be handed over to them, and the inspec tors and the other commanders will refuse to recognise such appoint ments, and declare that they have entirely lost their confidence in them. 3. If, on account of pressure exercised by the Entente Powers for the purpose of facilitating the occupation of the country, the Govern ment should order any Coips or any part of the Army or of any national organisation to be disbanded, such order must neither be taken any notice of nor obeyed. 4. The Army will resist any influence or interference which would produce the weakening or dissolution of anti-annexation societies or unions for the defence of national rights, the efforts ^of which are aimed at the maintenance and preservation of national independence. 5. The Civil Administration, in the same way as the Army, is the lawful protector of the union for the defence of national rights and anti-annexation leagues in their effort to safeguard the independence of the State and the Nation. 6. If any part of the country is attacked, the entire nation is ready to stand up for its rights. In that case, each district will imme diately communicate with the others in order to insure co-operation and joint action. These instructions were addressed to each of the Army Comman ders and all commanders of Corps in Anatolia and Rumelia, as well as to every other person concerned. I must confess that I was not at all satisfied with Refet Bey s action. Constantinople had been informed of his co-operation with me. If a man who is regarded as a member of this active body arrives on board an English ship to supersede him, it must directly and naturally follow that he is serving the designs of the English. Even allowing that this is no more than a mere surmise, Refet Bey ought not suddenly to have surrendered his command, but ought at least to have waited until he had heard what I thought about it. Firstly, the expression in Refet Bey s telegram “Selaheddin Bey will work in the interest of our cause/ was a definite statement; secondly, Refet Bey had not actually left for Constantinople. As it was, I sent a message to all the commanding officers, drawing their attention to the fact that “if they made the mistake of going to Constantinople, they would be doing something for which the country might be called upon to pay dearly, and, therefore, in future we should be very careful to carry out our programme strictly.” On the same day, the 14** July, I sent a telegram in cipher to Refet Bey contain ing, amongst other things, this expression : “The news that Selaheddin will take care to carry through our plans has made our comrades very happy indeed and has encouraged them very much.” To Selaheddin personally I sent the following telegram : July 14 th . To the commanding officer of the 5 th Division at Amasia: For Refet Bey. The first signs of doubt and uncertainty about Selaheddin Bey arose through this same Refet Bey, who had shown his confidence in him when he said that “Selaheddin Bey will work for the cause/ and who, after he had handed his command over to him, had left for Sivas. Refet Bey s telegram from Amasia, indeed, expressed not only doubt concerning Selaheddin, but also contained certain other im portant things. If you will allow me, I will read it to you. Urgent. Strictly confidential. No. 719. From Amasia, I3 t!l July, 1919. Hamid Bey, who is mentioned in the telegram, was at that time Governor of Samsoon. Refet Bey had known him for a long time. He had already recommended him to me soon after we had arrived at Samsoon. He was convinced that he was a man who combined in himself the necessary qualifications to work loyally with us in the interests of the cause. We had succeeded in getting him appointed to Samsoon by writing to the Grand Vizier and, privately, to Djevad Pasha, Chief of the General Staff. Could there have been any doubt at aU that such a person would sooner or later be dismissed? Refet Bey, however, stated that steps were being taken to detain him. “To detain” him but where? 1 Something has happened” but what ? and by whose authority? He added that he did not think that he would remain in that district if he were dismissed from his office, but all the same, “I shall work on him”! But where would he go to? To Constantinople? How? Has he not been working with us till now? In his telegram Refet Bey says that he considers it certain that the English will exert pressure on the Government to have him re called, but that nevertheless he will remain on the spot ^and act according to circumstances. The position, however, was quite clear, and I had indicated in the instructions I had circulated on the 7^ July what he was to do (No. 2 of the instructions). No other steps were to be undertaken. Refet Bey had been able to learn from the Englishmen and an American travelling through that “Kiasim Pasha was also in danger.” What did all this mean? To what should we attribute the attitude of these men who should be the very first to give proof of their firmness, and yet who appear to be dreaming of imaginary dangers and put their faith in others who are certainly not our well-wishers and who speak of these fanciful dangers in a tone of conviction? The interpretation of the expression “very careful” I leave to the judgment of sane persons of understanding. If the person who advised me to proceed carefully would have given me this advice before he had abandoned his post, it seems to me that he would have acted with far greater sincerity. 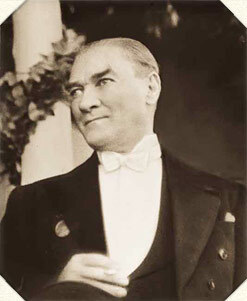 If I had already regretted that Refet Bey had given up his command, I was very sorry indeed to learn on the very same day that another comrade on whom we had absolutely relied had taken up an incom prehensible attitude on an important question, just as though we were still living under normal conditions. “The nation, driven to despair by the ever-increasing scandals in Constantinople, is trusting that a ray of hope will come from the east. The people have endowed these places and those who dwell in them with such phantastic shapes and forms that I ask myself whether they are real. I am ashamed of my own indifference. “Surely we are not asleep. We are eager to do something. But I have come to the conclusion that we are going to be entangled in theories and that we have chosen the longest road to arrive at our goal. The time and the condition of affairs in the country will not allow us to go on waiting. The situation is getting worse every moment. Therefore, we must decide promptly what we are going to do, and do it at once. Considering that Hamid Bey told us five days before that he intended to go to Constantinople if he should be recalled, I think you will find his telegram rather energetically worded, but all the same it shows a decided and active spirit. The Governor wonders whether things are really what they seem and whether the nation may look for a ray of hope coming from the east. He must think us to be dolts and fools, who do not know what we are doing or how to act decisively and quickly. He would have done better if, after having said all this, he had not aired his opinions, which only showed his total incapabil ity of judging rightly.